This article presents a powerful method for customizing your keyboard in almost every aspect of it. Let’s say you were searching for a keyboard that has a sign like this ? (smiley face) or £(pound sign) or you want a simple numeric keyboard and you just don’t find the keyboard that will contain all your desired characters in the right place. So if you have some time to spend and some basic computer usage skills we are ready to go. Requirements: One PocketPC running Windows Mobile 4.0/5.0/6.0/+ connected to your computer via ActiveSync and Teksoft Fingertouch Pro installed on your device. You can download FingerTouch Pro from www.teksoftco.com. How do I add a different key to my FingerTouch layout? 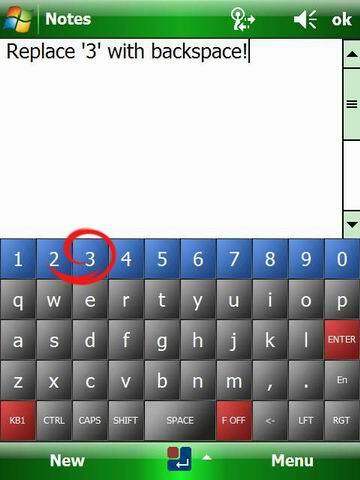 Let’s say you want to replace the key showing character “3” with backspace(“<-”).
. Connect your Pocket PC to your Desktop PC using ActiveSync and install Fingertouch PRO.
. Using ActiveSync’s Explore function, go to Program Files/Teksoft/ FingerTouch/KBLayout on your device. There you should see 2 TXT files.
. Copy the layout for the language you want to change to your PC and open it with Notepad or Wordpad. 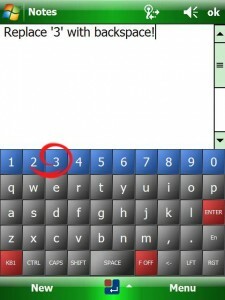 I chose KbLayoutEnglish.txt so I would modify the English layout of Fingertouch PRO. Note: Do not delete the “;” sign in front of some lines otherwise it will not work properly! 31 0031 0021 1000 0 0000 0000 0048 0048 1 1 ! We found the position of the key that we want to replace, now the only thing left is to search for the backspace key information. In the new line (backspace), replace the x, the y, the width and height of the button (marked with red up) with the coordinates of key with character “3”.
. Soft reset the device. SUCCESS: The third button “3” was replaced with “<-” backspace! How can I add a key in FingerTouch layout when this key is new and nowhere to be found in the KbLayoutEnglish.txt file? The default layouts are quite comprehensive, so most of the keys are already defined in the KbLayoutEnglish.txt file. In this case you only need to search for what you need, copy and paste it over the key you want to replace and only modify the position and the size of the button as the rest remains the same (see previous article section). 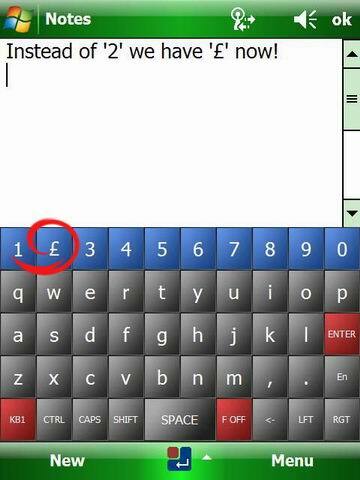 But what if we want to add a key that is not defined in KbLayoutEnglish.txt file, like the pound “£” sign? 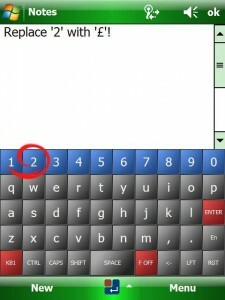 Let’s say we want to replace the second key ”2”(shifted “@”) with the “£”(shifted “¥”) pound sign.
. First steps are the same as in the previous section: you need to connect to the device, copy the layout file on your computer, and open it with Notepad or Wordpad.
. 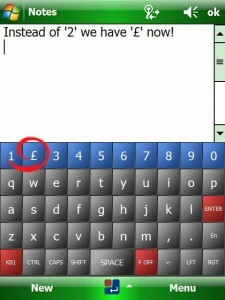 Replace the information for the second key (character “2”) from the first keyboard, with the “£” pound sign. The second line represents the character “2”, this is the line to be modified! On your desktop computer go to Start->Accessories->System Tools->Character Map and search for the character you want, select it and in the left corner there will be a code for the pound sign £ the code is 00A3 and for the Yen sign ¥ the code is 00A5. 1. 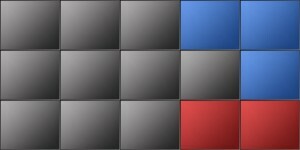 For the majority replace 32 with 00, except CTRL, CAPS, SHIFT, LEFT, RIGHT, and some other keys that you can find them in the file and use them. 6. 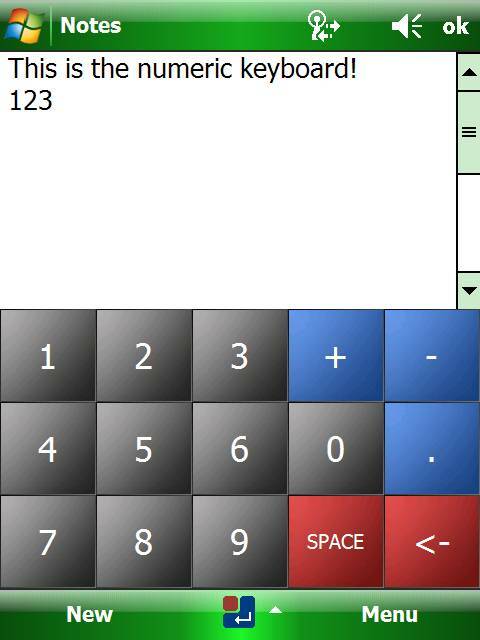 0048 0000 0048 0048 is the x,y position and the width,height size of the button, modify if you want a different position and size, but this is not the case as we only want to change the button character not the size or position. 7. 1 if you want the symbol to be drawn on the button, 0 if you don’t…I suppose you do so it will be 1. 9. And the last one replace @ with ¥, this is the shifted character that will be drawn on the button. SUCCESS: The second button “2” has been replaced with “£” sign! How can I make my custom keyboard with a given number of keys of various size and content? a. Which keyboard you want to replace from the existing 5. 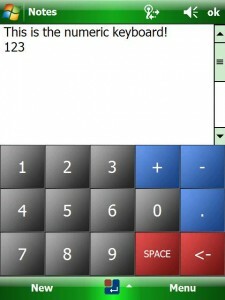 My recommendation is that you go for the first as it‘s the simplest one (with no multi character keys – like in the second, with no double tapping or multi tapping keys like the Phone keyboard and the last keyboard, and with no display screen for the numbers like in the calculator keyboard). b. Assume we chose the first keyboard to be replaced/edited. Let’s take the VGA format for this example. We need to decide the size of one button. Let’s say one button will be 96×80 pixels. As we have 15 keys will have 5 columns and 3 rows (this can be changed), so the size of the keyboard will be 96*5=480 x 80*3=240 pixels.
. Second thing you have to do is to edit the layout with the number of keys, the key’s information and the number of rows of your keyboard .Here are the steps for achieving the desired layout. a. Go to Program Files/Teksoft/FingerTouch/KBLayout on your device, copy the layout for the language you want to change to your PC and open it. I chose KbLayoutEnglish.txt again. c. Modify the keys for the first keyboard. For this see the previous sections to learn how to modify button’s information. with the 15 buttons that the new keyboard will have. 31 0031 0021 1000 0 0000 0000 0096 0080 1 1 ! 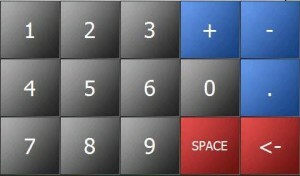 As you can see the size of the buttons is changed to the new value: 0096 0080 instead of 0048 0048 and the position accordingly. Even if your device has QVGA resolution, the size and the position for the buttons will still be represented as in VGA resolution(multiplied by 2). Modify the first number 5 with 3 as this is the number of rows in our numeric keyboard. And you’re done with the keys layout!
. Replace the KbLayoutEnglish.txt layout file from the device with the new one.For this go to Program files/Teksoft/FingerTouch/KBLayout. Program files/Teksoft/FingerTouch/Images/Default with the new image.
. On your device go to Options(next to the keyboard icon), select the tab keyboard and set the default keyboard to KB1 so that the keyboard you’ve modified will be the first one.
. Soft reset the device and you have your new keyboard. Enjoy! Hi Engel.I would be glad to have it translated to German. Don’t forget to post the link. Thanks RYErnest. Glad you like it. Hello Geld, that would be great, thanks. 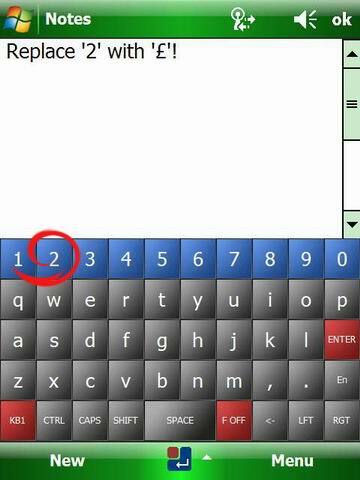 However, is it possible to create a keyboard which resembles standard number keyboards on mobile phones withouth touch screen? So if you want a ‘c’ you’d have to press  three times? 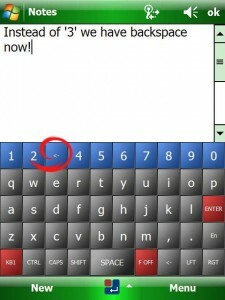 This would be great as it is much faster to type on a small display with 9 big buttons than on one with 49 small ones.